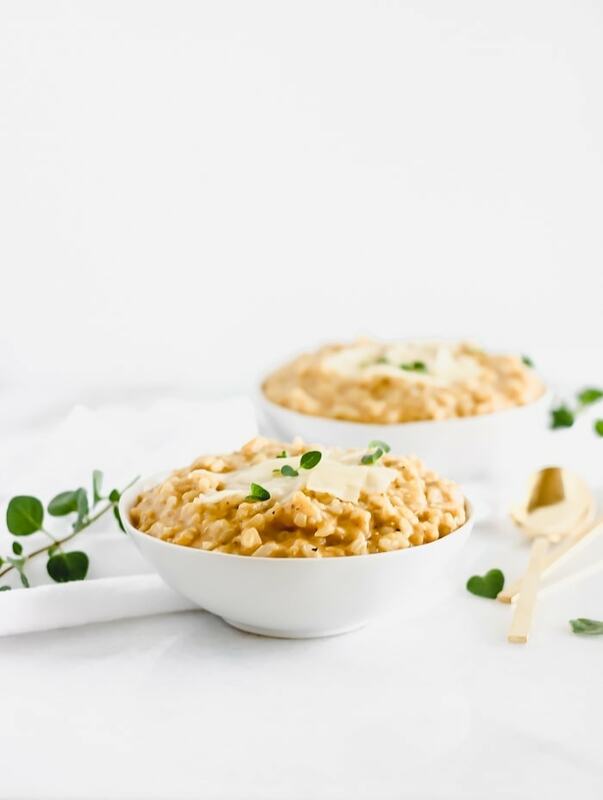 But before you swear off pumpkin for another 10 months, consider making this delicious cheater’s Pumpkin Risotto. It takes a break from the cinnamony-sweet flavors that you’re used to in every other pumpkin spice anything, and uses savory herbs and parmesan instead to give you a totally different taste of your favorite fall staple. But wait, isn’t risotto hard to make? No. 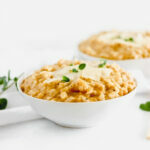 But just in case you still don’t want to make risotto, this is a cheater’s recipe. 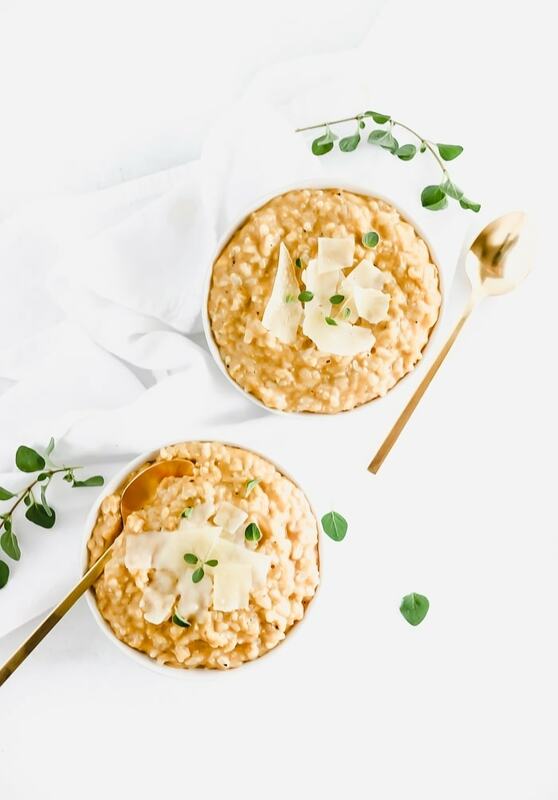 It takes advantage of the creaminess of pumpkin, nonfat greek yogurt, and parmesan cheese to bring you a risotto without (what seems like) hours of stirring. And it’s loaded with fiber from the whole grains (I use sprouted brown rice) and beta carotene from the pumpkin! In a food processor or mini chopper, blend onion and garlic until finely minced. 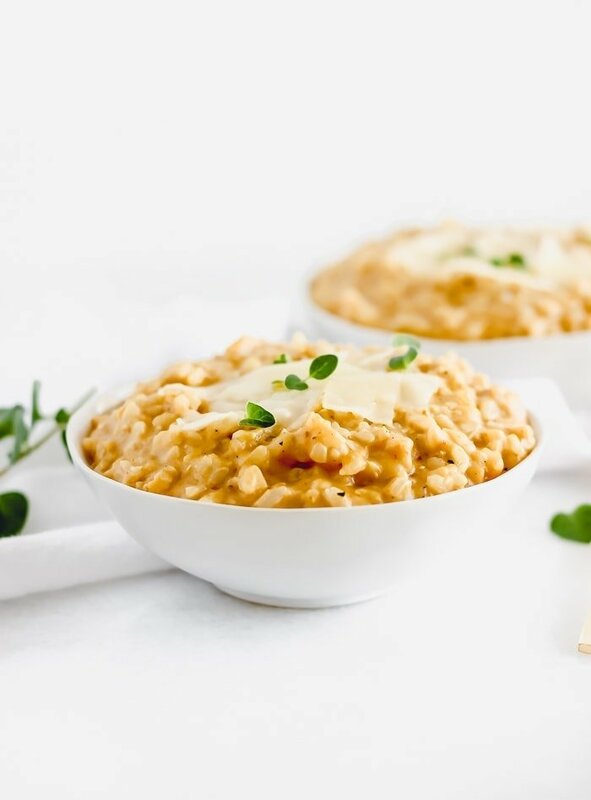 In a large saucepan, combine rice, broth, onion, garlic, and 1/4 cup pumpkin puree. Cover and cook according to package directions. In the last 10 minutes of cooking, remove lid and stir in remaining pumpkin puree and spices. Gradually stir in white wine, a little bit at a time while stirring constantly, adding more liquid as it is absorbed. Keep stirring and adding liquid until rice is tender, about 10-15 minutes. Once rice is tender, remove from heat and stir in parmesan and yogurt. Top with additional parmesan, if desired when serving.